I am totally adding eggplant next time. That sounds awesome! I need to make this again! So glad you liked it, thanks! You are a hummus fiend! 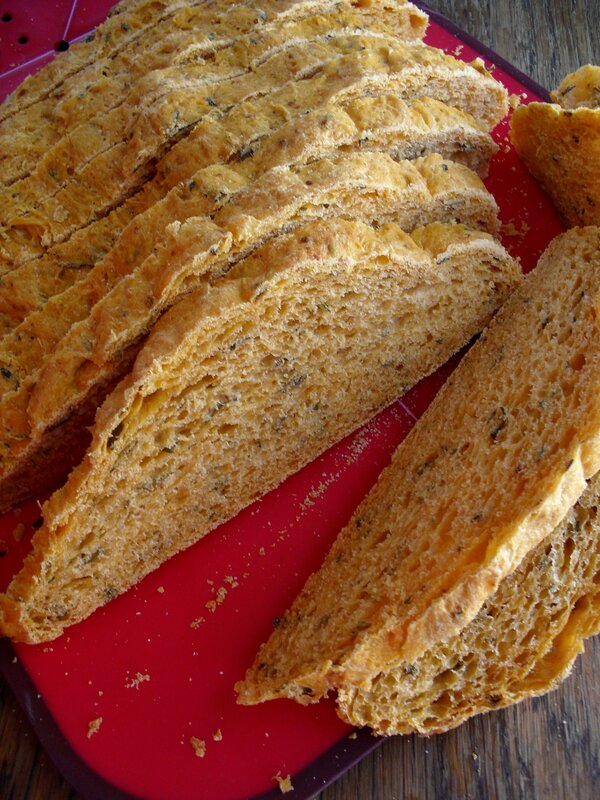 =) And even though you say your bread was ‘messed up,’ it sure photographs well! Your bread looks like it is very good. 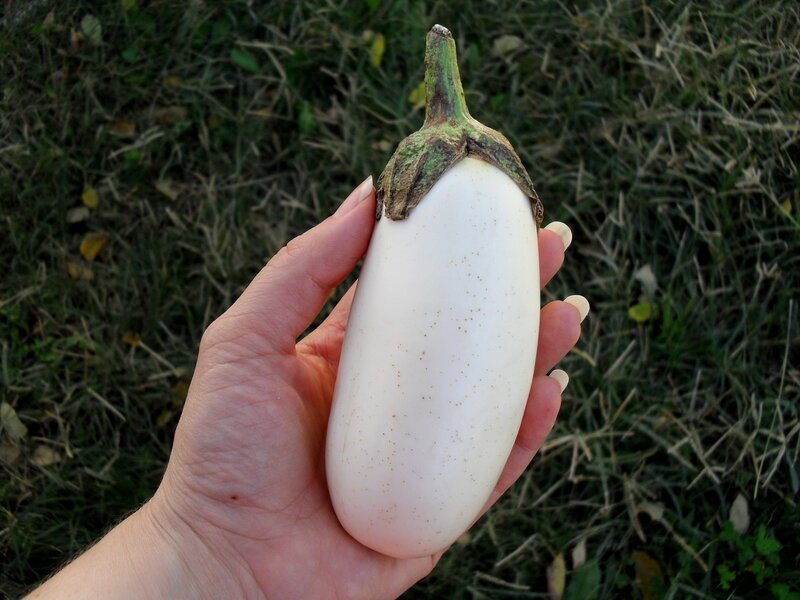 I have never seen a white egg plant. Or am I thinking of something else, the purple one? Is this hummus the same as your hubby likes? Thanks for sharing all the recipes. I don’t know if I can get my hubby to try this…hummm, have to see. You’re thinking of the right thing–yes, they are usually much bigger and purple. White isn’t usually sold in supermarkets–I found it at our farmer’s market. 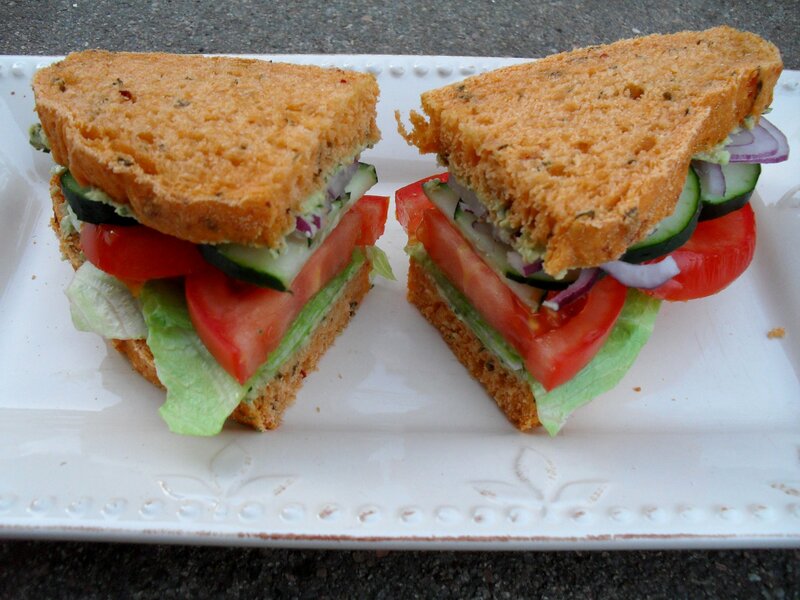 The hummus is a different recipe from the one Dennis likes, but he liked this kind on the sandwich. That looks GREAT! like the new background! P.S. can you make the bread in the bread maker? I really like using my bread maker. I bet you could, Margaret. I will have to try that next time. Just keep an eye on it while it kneads to see if you need to add flour or water to make the texture right. 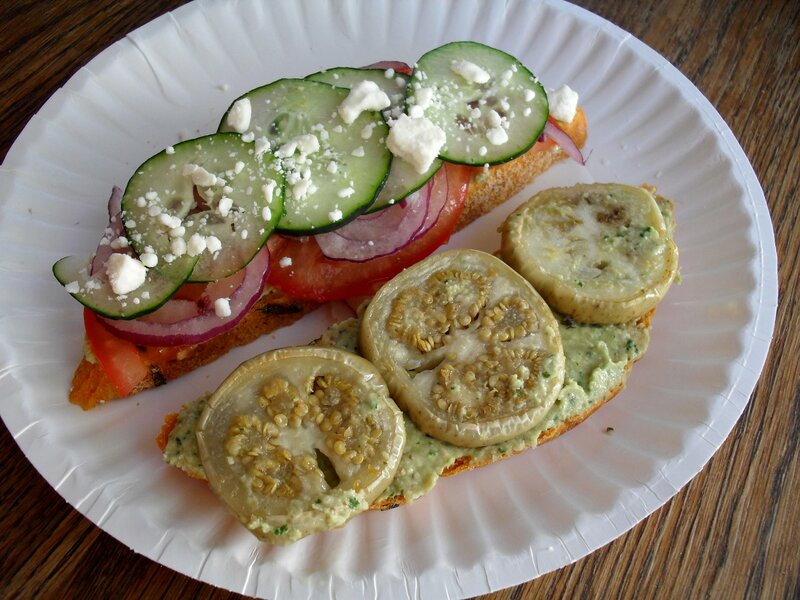 You are making my mouth water with all of these delicious Mediterranean dishes!! Soo up my alley… keep them coming! That tomato basil bread looks amazing!!! I am so jelaous of your bread making skills. The sandwich sounds right up my alley, too. This so healthy and delicious! 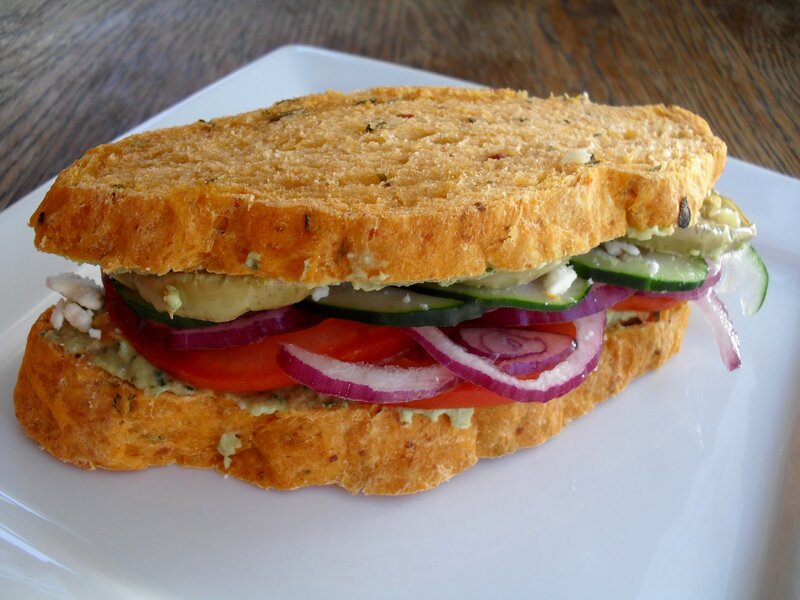 This sandwich is LOADED with amazingness! All of my favorite veggies and SO SUPER HEALTHY. I’m in love. Oh man, what a sandwich!! It’s brilliant, Veronica! I love the flavors and colors of this. Now that is what I call a sandwich! I love the flavors going on in there and I think your bread looks great! That sandwich is mouthwatering! I love the eggplant and I am envious (is there such a thing as eggplant envy?). I have never seen anything but purple eggplants at the markets out west. Hmph! LOL, well, I don’t think there’s any difference in flavor, though I think I recall the smaller size making it seem a little less spongy and more tender. I’m really digging that tomato basil bread. So pretty. Veronica, Thank you for posting this! I made a semolina bread with the added flavors of your bread. It makes such a lovely loaf.